Facebook user’s open letter to a mayor in a province in Rizal had gone viral. The open letter was accompanied by a controversial photo of a senior citizen’s ID. In his post on April 25, 2015, Jasper Dela Cruz shared that he is writing the letter as a concerned citizen of Pililla in Rizal. 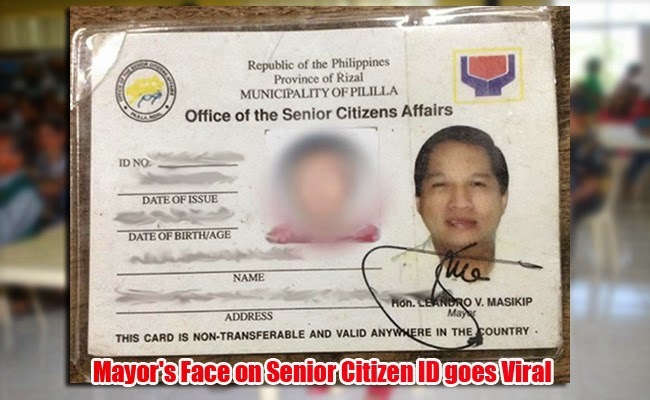 What started the issue is the photo of suspended Mayor Leandro Masikip on the left side of the senior citizens’s IDs in their municipality just beside the photo of the ID’s bearer. The mayor’s photo apparently is even bigger the the owner’s photo. Mayor Masikip had been suspended for 90 days by the Office of the Ombudsman due to charges of falsification when he and a government official had made it seem that members of the Sangguniang Bayan in Pililla had passed a resolution though the council did not even do any participation on it. According to Dela Cruz, the senior’s ID should only bear the information of the owner and not someone else’s. Also, an ID should only have a single photo and it should only be the owner’s photo since the purpose of the ID is for identification. There is no need to put another photo of another person since no person has two faces. He also shared that because of this, other seniors opted to apply for their ID in neighboring towns in shame to have the mayor’s photo beside theirs. He also bravely reminded the mayor that the ID is not a poster that can bear his face for political gains. Some senior citizens are also embarrassed to use their IDs to avail discounts and privileges in some establishments. He also challenged people who will be able to see a senior’s ID in their town to check if he is saying the truth. He also called Mahigpit as ‘epal’, a term usually used for politicians who inappropriately grabs credits for public service. Dela Cruz also calls foul on politicians who put their faces and names in almost every areas they can think of. In the end, he asks Mahigpit to reissue new senior citizens IDs without his photo.